Storm clouds move into downtown on June 12, 2013. CHICAGO — Last year was the hottest on record, and if climate change persists, it could get a lot worse, a new report claims, warning Chicago's climate could mirror that of modern-day Texas by the end of the century. The report, part of a study examining climate change called the Risky Business Project, was funded by Bloomberg Philanthropies, the Paulson Institute and TomKat Charitable Trust, and examined how climate change may affect the Midwest, its cities, communities agriculture and businesses. "Rising heat resulting from increased greenhouse gas emissions is likely to affect the Midwest region's ten major metropolitan areas through higher heat-related mortality, increased electricity demand and energy costs, and declines in labor productivity," the report said. Further, it warned rising temperatures could harm crop yields and eliminate the ability to farm some crops, pushing them north. The report used climate-science projections to determine what the Midwest might look - and feel - like by the year 2100. It determined that climate change could have adverse affects on many sectors, including the economy. 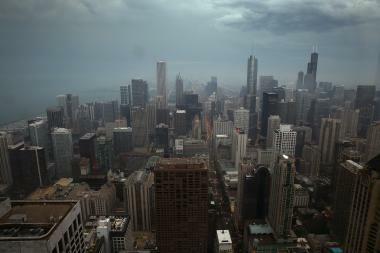 And it determined Chicago will experience "dangerous levels" of heat. "The average Chicago resident is expected to experience more days over 95°F each year by century's end than the average Texan does today," the report said. The report said while Chicago currently sees an average of three days with temperatures warmer than 95 degrees over the last 30 years, "if we continue on our current emissions pathway, this number will likely rise by 5 to 13 days over the near term, 9 to 30 extremely hot days by mid-century, and 20 to 83 days over 95°F likely by the end of the century." That could mean up to seven more heat-related deaths per 100,000 people, the report said. Other consequences, the reported predicted, include rising energy costs, an increase in violent crime and economic losses to due agriculture being harmed.